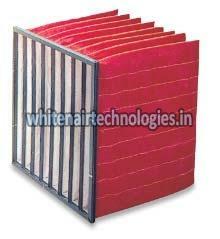 We are an illustrious Manufacturer & Supplier of Pocket Air Filter from Telangana, India. The Pocket Air Filter we offer is designed to handle large volume of air at high efficiency, low resistance and has a high dust holding capacity. We stock the Pocket Air Filter in our state-of-the-art warehouse to cater to bulk requirement of buyers. We ensure timely delivery of Pocket Air Filter across the country. Filter Frame : EPC Aluminium, EPC GI, SS 304.